Scatter charts and line charts look very similar, especially when a scatter chart is displayed with connecting lines. However, the way each of these chart types plots data along the horizontal axis (also known as the x-axis) and the vertical axis (also known as the y-axis) is very different. Note: For information about the different types of scatter and line charts, see Available chart types in Office. Before you choose either of these chart types, you might want to learn more about the differences and find out when it's better to use a scatter chart instead of a line chart, or the other way around. The main difference between scatter and line charts is the way they plot data on the horizontal axis. For example, when you use the following worksheet data to create a scatter chart and a line chart, you can see that the data is distributed differently. In a scatter chart, the daily rainfall values from column A are displayed as x values on the horizontal (x) axis, and the particulate values from column B are displayed as values on the vertical (y) axis. Often referred to as an xy chart, a scatter chart never displays categories on the horizontal axis. A scatter chart always has two value axes to show one set of numerical data along a horizontal (value) axis and another set of numerical values along a vertical (value) axis. The chart displays points at the intersection of an x and y numerical value, combining these values into single data points. These data points may be distributed evenly or unevenly across the horizontal axis, depending on the data. The first data point to appear in the scatter chart represents both a y value of 137 (particulate) and an x value of 1.9 (daily rainfall). These numbers represent the values in cell A9 and B9 on the worksheet. In a line chart, however, the same daily rainfall and particulate values are displayed as two separate data points, which are evenly distributed along the horizontal axis. This is because a line chart only has one value axis (the vertical axis). The horizontal axis of a line chart only shows evenly spaced groupings (categories) of data. Because categories were not provided in the data, they were automatically generated, for example, 1, 2, 3, and so on. This is a good example of when not to use a line chart. The particulate y value of 137 (cell B9) and the daily rainfall x value of 1.9 (cell A9) are displayed as separate data points in the line chart. Neither of these data points is the first data point displayed in the chart — instead, the first data point for each data series refers to the values in the first data row on the worksheet (cell A2 and B2). Because the horizontal axis of a scatter chart is always a value axis, it can display numeric values or date values (such as days or hours) that are represented as numerical values. To display the numeric values along the horizontal axis with greater flexibility, you can change the scaling options on this axis the same way that you can change the scaling options of a vertical axis. Because the horizontal axis of a line chart is a category axis, it can be only a text axis or a date axis. A text axis displays text only (non-numerical data or numerical categories that are not values) at evenly spaced intervals. A date axis displays dates in chronological order at specific intervals or base units, such as the number of days, months, or years, even if the dates on the worksheet are not in order or in the same base units. The scaling options of a category axis are limited compared with the scaling options of a value axis. The available scaling options also depend on the type of axis that you use. Change the scale of the horizontal axis Because the horizontal axis of a scatter chart is a value axis, more scaling options are available. Use a logarithmic scale on the horizontal axis You can turn the horizontal axis into a logarithmic scale. Display worksheet data that includes pairs or grouped sets of values In a scatter chart, you can adjust the independent scales of the axes to reveal more information about the grouped values. Show patterns in large sets of data Scatter charts are useful for illustrating the patterns in the data, for example by showing linear or non-linear trends, clusters, and outliers. Compare large numbers of data points without regard to time The more data that you include in a scatter chart, the better the comparisons that you can make. Use text labels along the horizontal axis These text labels can represent evenly spaced values such as months, quarters, or fiscal years. Use a small number of numerical labels along the horizontal axis If you use a few, evenly spaced numerical labels that represent a time interval, such as years, you can use a line chart. Use a time scale along the horizontal axis If you want to display dates in chronological order at specific intervals or base units, such as the number of days, months, or years, even if the dates on the worksheet are not in order or in the same base units, use a line chart. Note: The following procedure applies to Office 2013 and newer versions. Office 2010 steps? So, how did we create this scatter chart? The following procedure will help you create a scatter chart with similar results. For this chart, we used the example worksheet data. You can copy this data to your worksheet, or you can use your own data. Copy the example worksheet data into a blank worksheet, or open the worksheet that contains the data you want to plot in a scatter chart. Select the data you want to plot in the scatter chart. 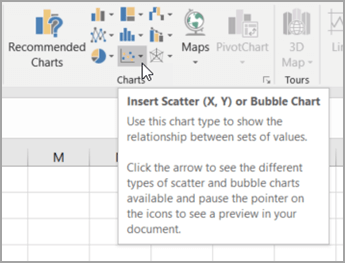 Click the Insert tab, and then click Insert Scatter (X, Y) or Bubble Chart. Tip: You can rest the mouse on any chart type to see its name. Click the chart area of the chart to display the Design and Format tabs. Click the Design tab, and then click the chart style you want to use. Click the chart title and type the text you want. To change the font size of the chart title, right-click the title, click Font, and then enter the size that you want in the Size box. Click OK.
To add a horizontal axis title, click Primary Horizontal. To add a vertical axis title, click Primary Vertical. Click each title, type the text that you want, and then press Enter. For more title formatting options, on the Format tab, in the Chart Elements box, select the title from the list, and then click Format Selection. A Format Title pane will appear. Click Size & Properties , and then you can choose Vertical alignment, Text direction, or Custom angle. Click the plot area of the chart, or on the Format tab, in the Chart Elements box, select Plot Area from the list of chart elements. On the Format tab, in the Shape Styles group, click the More button , and then click the effect that you want to use. Click the chart area of the chart, or on the Format tab, in the Chart Elements box, select Chart Area from the list of chart elements. Under Office, click the theme that you want to use. Copy the example worksheet data into a blank worksheet, or open the worksheet that contains the data that you want to plot into a line chart. 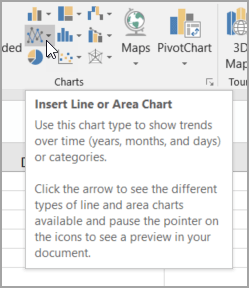 Click the Insert tab, and then click Insert Line or Area Chart. On the chart, click the legend, or add it from a list of chart elements (on the Design tab, click Add Chart Element > Legend, and then select a location for the legend). To plot one of the data series along a secondary vertical axis, click the data series, or select it from a list of chart elements (on the Format tab, in the Current Selection group, click Chart Elements). On the Format tab, in the Current Selection group, click Format Selection. The Format Data Series task pane appears. To add a primary vertical axis title, click Axis Title >Primary Vertical. and then on the Format Axis Title pane, click Size & Properties to configure the type of vertical axis title that you want. To add a secondary vertical axis title, click Axis Title > Secondary Vertical, and then on the Format Axis Title pane, click Size & Properties to configure the type of vertical axis title that you want. Click the plot area of the chart, or select it from a list of chart elements (Format tab, Current Selection group, Chart Elements box). Copy the example worksheet data into a blank worksheet, or open the worksheet that contains the data that you want to plot into a scatter chart. Select the data that you want to plot in the scatter chart. On the Insert tab, in the Charts group, click Scatter. Click Scatter with only Markers. For our scatter chart, we used Style 26. On the Layout tab, click Chart Title and then select a location for the title from the drop-down list. Click the chart title, and then type the text that you want. For our scatter chart, we typed Particulate Levels in Rainfall. To reduce the size of the chart title, right-click the title, and then enter the size that you want in the Font Size box on the shortcut menu. For our scatter chart, we used 14. To add a horizontal axis title, click Primary Horizontal Axis Title, and then click Title Below Axis. To add a vertical axis title, click Primary Vertical Axis Title, and then click the type of vertical axis title that you want. For our scatter chart, we used Rotated Title. For our scatter chart, we typed Daily Rainfall in the horizontal axis title, and Particulate level in the vertical axis title. Click the plot area of the chart, or select Plot Area from a list of chart elements (Layout tab, Current Selection group, Chart Elements box). For our scatter chart, we used the Subtle Effect - Accent 3. For our scatter chart, we used the Subtle Effect - Accent 1. For our line chart, we used the Office theme. For our line chart, we typed Particulate Levels in Rainfall. For our line chart, we used 14. On the Layout tab, in the Labels group, click Legend, and then click the position that you want. For our line chart, we used Show Legend at Top. To add a primary vertical axis title, click Primary Vertical Axis Title, and then click the type of vertical axis title that you want. For our line chart, we used Rotated Title. To add a secondary vertical axis title, click Secondary Vertical Axis Title, and then click the type of vertical axis title that you want. For our line chart, we typed Particulate level in the primary vertical axis title, and Daily Rainfall in the secondary vertical axis title. For our line chart, we used the Subtle Effect - Dark 1. For our line chart, we used the Subtle Effect - Accent 3. Select the data you want to plot in the chart. Click the Insert tab, and then click X Y Scatter, and under Scatter, pick a chart. Click Add Chart Element to modify details like the title, labels, and the legend. Click Quick Layout to choose from predefined sets of chart elements. Click one of the previews in the style gallery to change the layout or style. Click Switch Row/Column or Select Data to change the data view. With the chart selected, click the Design tab to optionally change the shape fill, outline, or effects of chart elements. Click the Insert tab, and then click Line, and pick an option from the available line chart styles .